Dermapen instigates collagen induction through the delivery of needles into the epidermis and dermis levels of your skin. The incisions cause micro injuries to your skin and encourage your body to regrow and repair the damaged skin through collagen induction. The body’s ability to remodel and heal itself is at the heart of this amazing product and because the process never involves heat or thermal energy or other chemicals or unnecessary trauma, the skin can quickly heal with almost zero downtime. 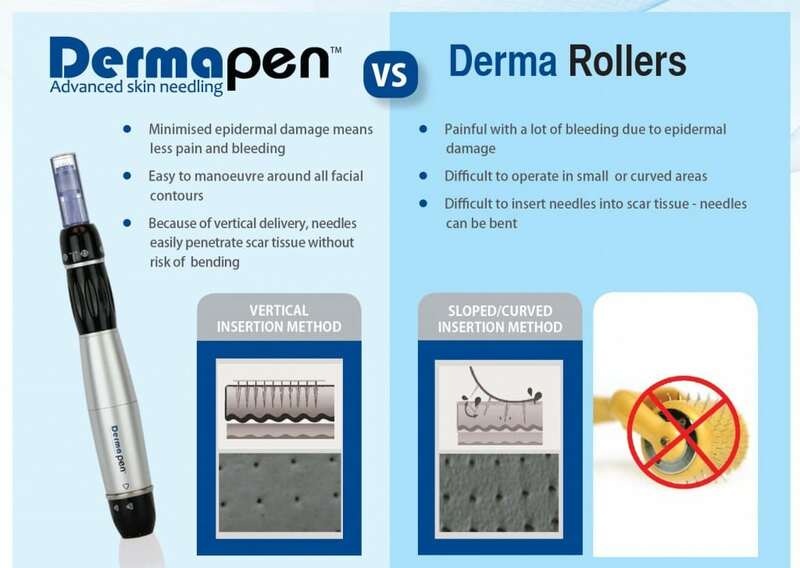 Dermapen is much safer and more effective in piercing the skin than other traditional skin needling rollers due to its unique vertical needling technology. It has a superior effect on collagen and elastin rejuvenation. Active ingredients are directly supplied to the deeper layers of the skin. Dermapen can effectively treat hard-to-reach places (e.g. around the eyes, nose, and lips). Because of the vertical delivery, the needles can easily penetrate scar tissue which can be hard to treat with traditional skin needling methods. Should I prepare my skin before a Dermapen treatment? For optimal results we recommend a period of effective active treatment creams such as Vitamin A, C or Resveratrol to allow the skins strength to build up. Typically, you will see results after the first treatment. Lasting and more significant results will occur after 4 to 6 treatments. Your skin will continue to improve over the next 6-12 months after a course of treatments and when combined with the recommended post care treatment. For minimum needle depths Dermapen treatments are painless. For treatments over 0.5 mm deep we apply a topical anaesthesia cream 15-40 minutes before treatment and that will render the treatments pain free.